We appreciate your feedback about your support experience with StoreApps, developers of WooCommerce Smart Refunder. This helps us maintain high standards on the WooMarketplace, and helps StoreApps improve. 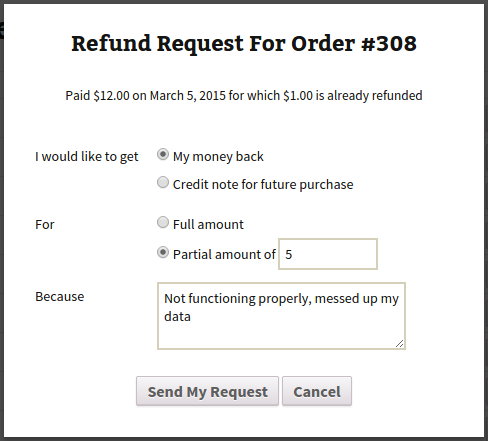 WooCommerce Smart Refunder removes pain from the refund process – both for customers and store owners. If you are selling virtual products, digital goods or subscriptions – the refund process can be fully automated with WooCommerce Smart Refunder. Customers request a refund and get it instantly. If you have chosen to provide a coupons for refunds, and customers want them, a new coupon is emailed instantly. 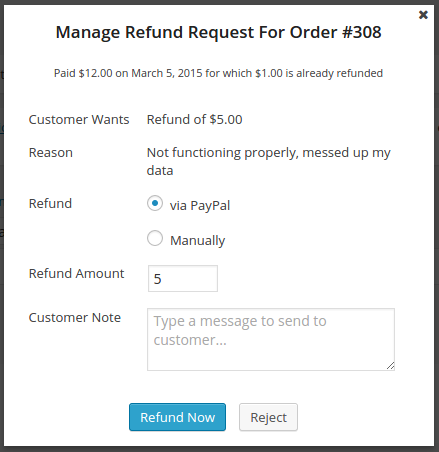 If you are selling physical products, or a gateway that doesn’t support refunds, Smart Refunder allows customers to request refunds from My Account, and shows refund requests to you in WooCommerce. You then process them manually and complete refund requests. This saves you time since all required details are available at your fingertips. This process could take hours to days, depending on how quickly support requests are processed. It’s never a pleasant experience for the store owner or customer. Processing the refund, store owner can accept or reject refund, issue full or partial refund, and can also send a message to the customer. Smart Refunder marks a new era in refund / returns management with WooCommerce. Eliminate the pain of requesting and handling refunds. Start using Smart Refunder today.